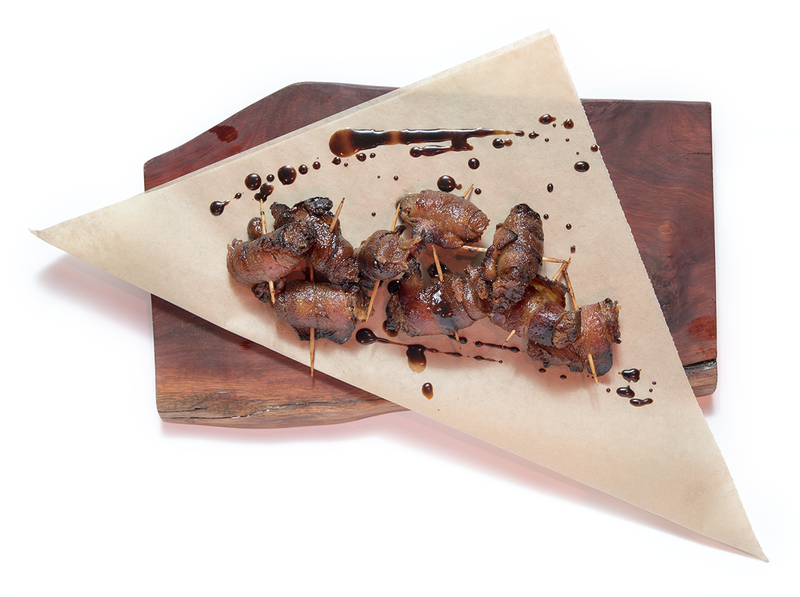 Make the crowd pleasing bacon-wrapped dates at home using this recipe by Chef Mike Jalili of Touch, Flame and Black Sheep. Serves 10. Best paired with Louis Picamelot Blanc de Blancs Brut. Recipe by Chef Mike Jalili of Touch Restaurant & Oyster House, Flame Steakhouse and Black Sheep Burgers and Shakes. From our January 2017 Cooking Class. Preheat oven to 350˚F. Remove pits from dates. Add dates, goat cheese and bacon grease to a mixer. Mix until all ingredients are well incorporated. Lay out bacon on a baking sheet, and bake for five minutes or until bacon is pliable. Spoon ½ tablespoon of mixture on each strip of bacon, roll and secure with a toothpick. Bake in oven for 10–15 minutes until bacon is completely cooked.